ROZAN BICO INC. is developing business internationally on the basis of WORLD WIDE RELATION BUSINESS and a management idea. In a fashion section, a store, a nail salon, etc. where the imported brand was selected carefully are developed in Tokyo, Kanazawa, Toyama, and Takaoka. In the select shop, a R B brand is begum and it is treationg focusing on the super brand from Italy and the other Europe, and the RB original BAG. The FEZUIRE string girdle is sold in the underwear section. In the art section, manufacture sale of Shinto-and-Buddhist-deities implements, such as a lantern and a Buddhist image, a bronze statue, and an interior design object is carried out from order manufacture in response to the request of casting from an engraver, a designer, and an art lover. Moreover, to the Art Navi Info site, the homepage and the private exhibition gallery are carried for the activity of an engraver and a designer, and word introduction. Takaoka Chugei-Sha, one of the leading makers of bronze statues, is proud of its 100 year history. Kozan Sakai, 53, is the seventh president of the firm located in Takaoka City, Toyama Prefecture, known as the center of bronze production. At the Beginning of the Meiji Era, the fifth president of the company, Riemon Sakai, opened a copper refinery at Ohtsubocho, Takaoka City. At the refinery, copper, silver and lead were produced with ores from the Yusenji Mine in Ishikawa Prefecture and the Kamioka Mine in Gifu Prefecture. The owner of the firm, Riemon, went on a sales tour to Osaka to sell silver which was one of the most valuable products in the Meiji Era. 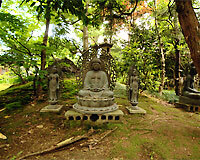 Jokichi Sakai, brother of Riemon, was also engaged in the manufacture of articles for Buddhist altars and braziers at a plant nearby the refinery. Ten-year-old Rizaemon Matsui, nephew of Riemon, is reported to have gained enough pay for three workers as a supervisor of the refinery. At the beginning of the refinery, charcoal had been used for casting instead of coke. According to the commercial and industrial directory published by the Osaka Prefectural Government in 1888, two plantsowned by Riemon Sakai and Gihei Momoi were operating. In the Meiji and Taisho periods, many articles for Buddhist altars and braziers were produced. But during the war in the Showa Era, no special products were manufactured because the use of copper was under strict control. After the war, the firm started producing statues. 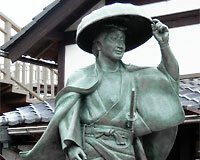 In 1946,the statue of Princess Nyoze was unveiled at the front of Nagano Station of the Japan National Railways. 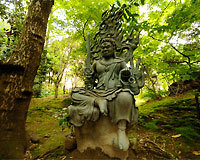 Among the leading products of the company are the statue of Prince Seiho Meda in a park at the former site of the Toyama Castle, the statue of Katsuie Shibata, a feudal lord enshrined at the Shibata Shrine in Fukui City, the bronze image of Jizo at the Zenkoji Temple in Nagano City, a big incense burner weighing 1,600 kilograms at the main hall of the temple, the image of Kannon in Komoro City, Nagano Prefecture, and the Statue of Peace in Toyokawa City, Aichi Prefecture. It took two years to produce the image of Kannon in Komoro City, which had been modeled after the image of Kannon at the Yakushiji Temple in Nara. 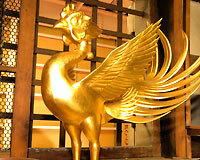 The firm has so far shipped some 500 bronze statues to Hokkaido, Kyushu, Vietnarn and Hawaii. The products include bronze statues of Kenzo Matsumura, statesman, Sohachi Yamaoka and Yakumo Koizumi, both novelists, and Mrs. Kazutoyo Yamauchi, wife of a feudal; load. 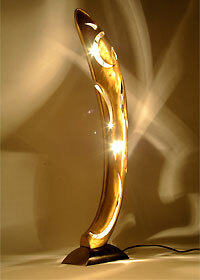 There are many bronze statues, produced by the firm, in major cities of the country. At the residence of Kenzo Sakai, there are numerous original molds for statues of the leading figures in Japanese political and financial circles. There are many difficult stages in the production of statues, Kozan Sakai said, adding that his firm differs from mass production plants. He said that efforts have been made to produce small but fine bronze statues. The firm has now devoted itself to the study of the image of Buddha. In the meantime, the inscription for the statue of Mrs. Kazutoyo Yamauchi in the Kochi Castle was written by former Prime Minister Shiger Yoshida. After the unveiling ceremony of the statue, many receptions were held by the women leaders in Kochi City. The Statue of Peace was also produced to console the soul of 2,477 women workers who were killed in the air raid on the Toyokawa Navy Arsenal in Toyokawa City, Aich Prefecture. In commemoration of the centennial of immigration, an image of Buddha has been unveiled in Hawaii. The inscription for the statues have ales been written by such famous figures as Dr. Hideki Yukawa, Nobel Prize winner, and Ikutaro Nishida, a philosopher. 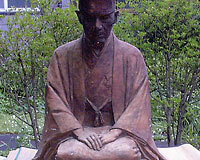 Among the original forms for statues are those made by the noted scuptors including Seibo Kitamura. Taiju Sasaki and Sotojiro Matsumura. Kozan Sakai is planning to product a total of 1,000 bronze statues. After the completion of his word, he wants to visit various parts of the country where his masterpieces are on display.